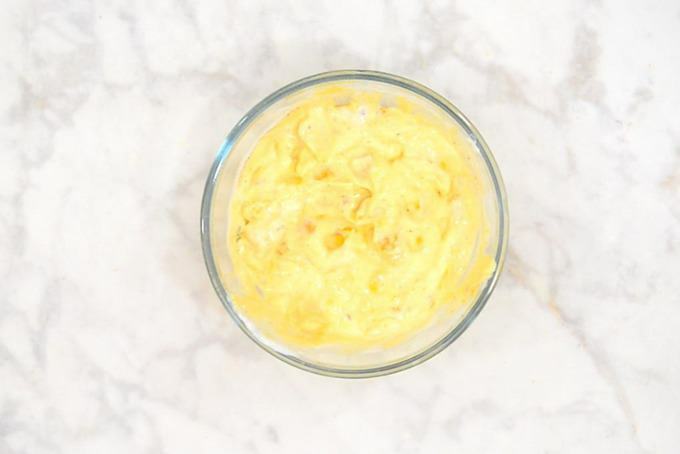 Mango Raita is a delicious curd based accompaniment which goes very well with any meals. Ripe mango and mint makes this raita very special and a must make during summers when mangoes are in season. Here is how to make Mango Raita Recipe. Raita is basically whisked curd flavored with any type of flavoring and either some fruits or vegetables are then added to it. Curd is an integral part of the meals at my home and I try to make a variety of Raitas as an accompaniment. 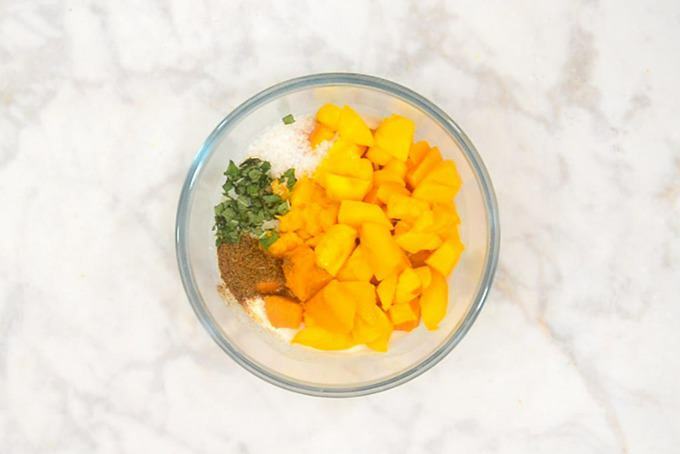 As mangoes are back, I regularly prepare Mango Raita at home. Both my husband and kiddo have sort of fallen in love with it. 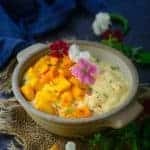 Mango puree, diced mango and fresh curd, a pinch of salt, sugar and cumin powder and fresh mint leaves is all you need to prepare a delicious Mango Raita. It is creamy and succulent. Moreover, the sweetness of mangoes and the slight tang of curd, complement each other very well. My son loves eating Mango Raita with Laccha Paratha and Vegetable Jalfrezi. I like eating Mango Mint Raita more with Vegetable Dum Biryani. You could even vary the ingredients and make any variations of raita as you want.One of the many reasons for eating raita is that the curd is full of bacteria that is good for the digestive tract. I also make Mango raita using Raw Mangoes and it taste delicious too. You can check out the recipe to make Raw Mango Raita here. Moreover, it even has vitamin D and calcium. By eating raita, you not only gain vital nutrients but even enhance your health. The best part about eating Mango Mint Raita is that during summer, you feel all cool and satisfied after eating it, this raita makes your diet balanced. Having learned much about Mango Raita today, I suggest why don’t you quickly bookmark its recipe and try it home sometime, eh? 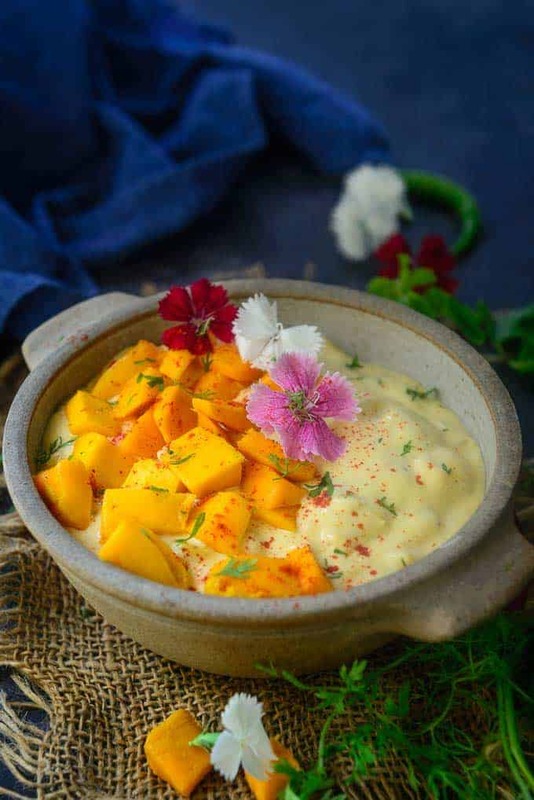 Mango Raita is a delicious curd based accompaniment which goes very well with any meals. Ripe mango and mint makes this raita very special. 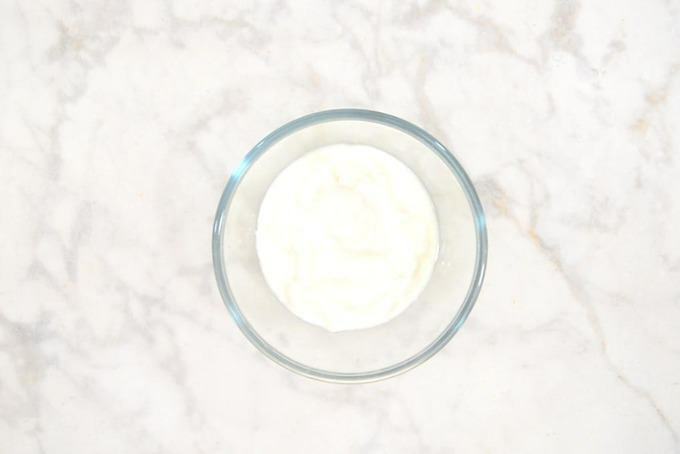 Whisk the curd till it is smooth and creamy. 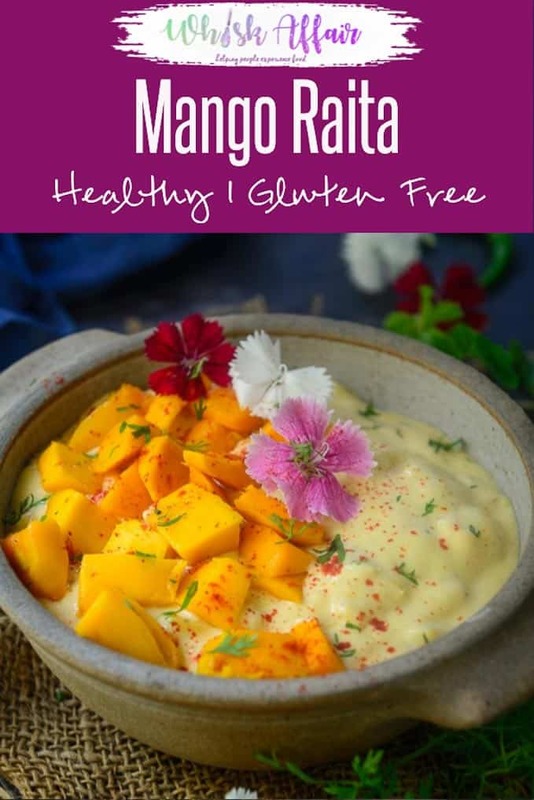 Nice Recipe, I love mango and will definitely try mango raita.